Wayne, Pa. (December 12, 2017) —Dolco Packaging, a Tekni-Plex business unit, will exhibit its latest egg carton and processor tray innovations at theInternational Production & Processing Expo (IPPE), Georgia World Congress Center, Atlanta, January 30 to February 1, 2018, Booth B4145. In addition to its standard processor trays, Dolco will be highlighting its custom-designed alternatives to help meat and poultry processors draw attention to the unique attributes of their products. Examples include compartments/dividers for sausages, deep-draw pockets for meat patties, structural indentations for easy removal and many more. The objective is to help processors increase sales by using packaging to drive differentiation. 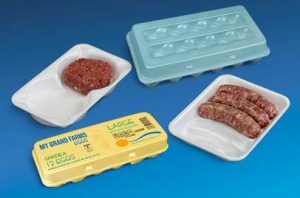 As the largest producer of foam egg carton trays in the United States, Dolco also will be displaying various structures and configurations designed to protect eggs throughout the distribution cycle. The company’s offerings also include apple and pear trays and mushroom tills, as well as industrial and custom packaging solutions for agricultural, food and food service markets. Dolco operates five manufacturing facilities across the United States. For more information visit www.tekni-plex.com/dolco.